A smorgasbord of video content is spread out atop the table of the web, but much of it is inaccessible to TVs and devices like Roku. But for content hounds who want to have it all, including the kitchen sink, MediaMall says it has the solution. The company’s PlayOn media server plays internet (and local) video on your PC and streams it to your game console, Roku, Chromecast, or another supported device connected to your TV. It’s even got companion software, called PlayLater, that records that internet video to your hard drive, so you can play them back later. Netflix, Hulu and other video sites often have content rotating in and out of availability due to licensing agreements. A video that you can “watch instantly” today might not be available next week. PlayLater lets you save those videos and watch them forever—even though that’s against each service’s stated terms. Since MediaMall just added Chromecast support, we were excited to dive in. What we found was hit or miss—but mostly miss. 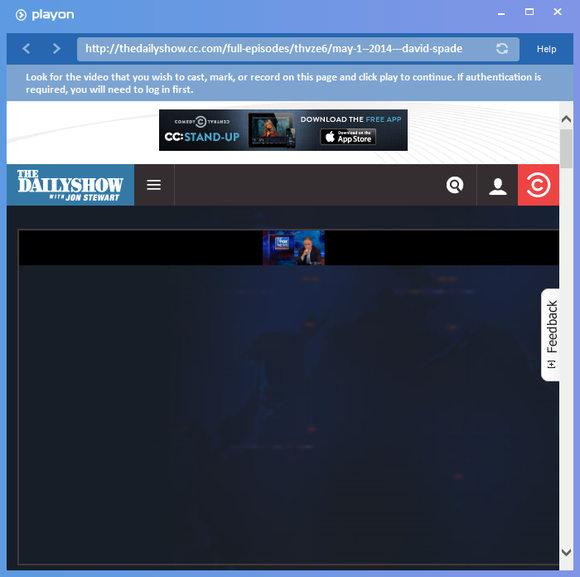 It's easy to integrate PlayOn with your browser. The Quick Start Guide works well. 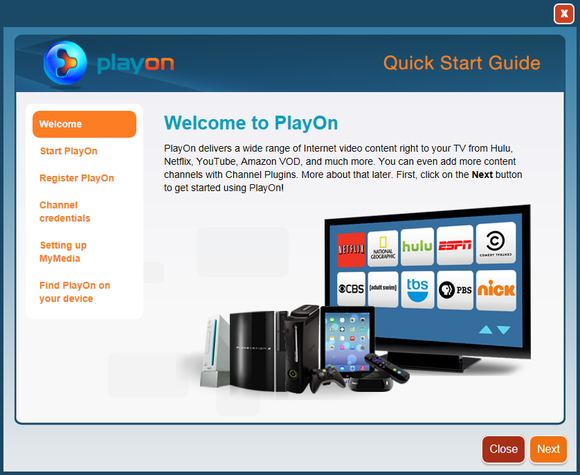 All of the major video websites are in PlayOn’s channel list—Netflix, Hulu, YouTube, Amazon Instant Video, and many more. Some require a pay TV provider’s credentials in order to function, but there are plenty of non-pay-TV channels available as well, making PlayOn a worthwhile consideration for cord cutters. The TV series Hannibal is just one example—Hulu has it on the web but not in the apps. 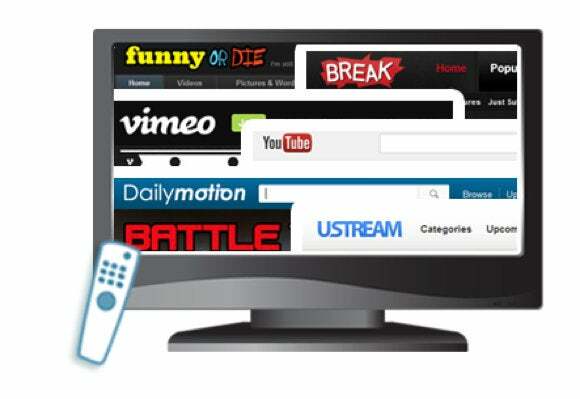 PlayOn can fling this web-only video to your TV-connected device, thumbing its nose at the restrictions. You don't even need a Hulu Plus subscription to see plenty of full episodes. Hulu has native apps on both Chromecast and Roku, so streaming from PlayOn isn't strictly necessary, but you'll find a little more content that way. And not every video providers has apps for every platform: Amazon Instant Video doesn’t work with Chromecast, but PlayOn can fill that void. 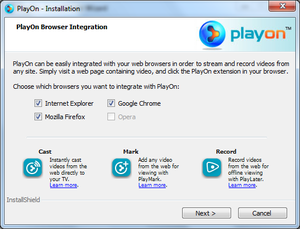 PlayOn’s browser extension lets you browse for a video on the web and then click the extension’s button to launch it in the PlayOn browser window. From there, you click the “Cast to TV” button in the bottom-left, which allows you to select a device to receive the stream. After a brief loading period, the video should then begin playing on your selected device. Chromecast support was added recently. The video quality coming from PlayOn varied from great to a little bit pixelated. If you have another method of getting the video that you are looking for onto your TV, such as through a content provider’s official Roku channel, you’ll likely get better picture quality going that route. PlayOn offers apps for Android, iOS, and a few other mobile devices. I was able to easily connect to my PlayOn server with my Moto X. Both devices need to be on the same network, naturally. 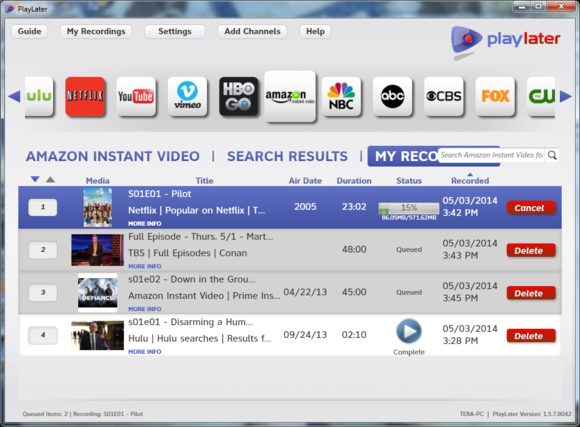 PlayOn's Android app can play video or cast it to from the server to the TV. For the most part, the PlayLater recording software worked wonderfully for me. I was able to record content from Hulu, Amazon, TBS and Netflix, all without any problems. (Just keep in mind that doing so violates each service’s TOS.) I was also able to stream the PlayLater recorded videos to my Android smartphone and my Chromecast. Warning: None of these services allow you to record their programs without express written consent. The PlayLater software inserts a slide with your name, email address, and IP address at the beginning and the end of each recorded video, so you probably don’t want to upload these videos to the Pirate Bay. Oddly, there is no “Cast to TV” option within the PlayLater interface, only an option to play the video locally. 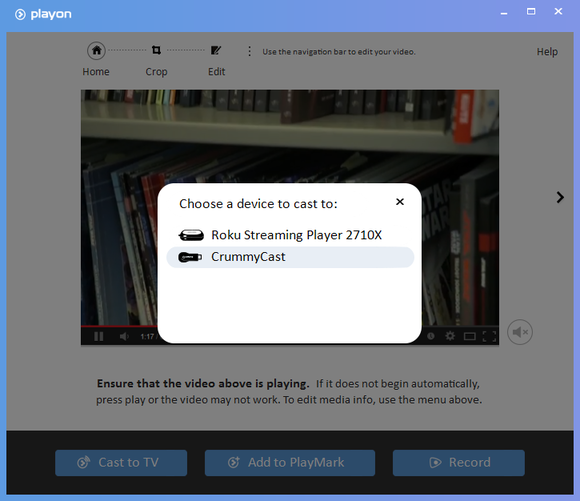 You have to use one of the PlayOn apps to cast recorded content to your TV. One quirk I found annoying while browsing Hulu is that PlayLater displays many of the short clips with the label “s01e01,” misleading you into thinking a clip is a full episode. Unfortunately I had a heck of a time getting the PlayOn software to work reliably. Sometimes it would work flawlessly, other times it was an exercise in futility attempting to get a video to play. My PC exceeds the minimum requirements, and the System Check tab within PlayOn’s settings even confirmed that my system was up to snuff. I received ‘Max’ results for bandwidth and CPU, and all green for hard drive and memory. And even though I use all 802.11n Wi-Fi in my house, I even had issues with PlayOn when I tested with the PC hooked up to a wired connection, with 40Mbps speeds. Weird behavior like this was pretty common. My first attempts to stream Hulu videos to my Chromecast or Roku were a failure, with the PlayOn load screen getting to 100 percent and then freezing up or just displaying a black screen on my TV. Strangely, after I tried a few other video sources and then went back to Hulu, everything worked just fine. 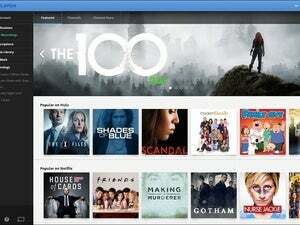 From then on out, Hulu was actually one of the services that worked the most reliably with PlayOn. Netflix was another story. I saw the Silverlight plugin freeze up, PlayOn become unresponsive, a black screen show up on the TV instead of video, and other oddities. At times when PlayOn became unresponsive on my PC, I’d see the CPU usage shoot up high and remain pegged until I restarted PlayOn. With all the issues I had with PlayOn, I’d be hard-pressed to recommend it, but perhaps you’ll have better luck than I did. MediaMall needs to fix some bugs and improve the compatibility if PlayOn is to be the all-encompassing internet video solution that they advertise it to be.